The author of this book comes endorsed by a Professor of English, Provost of an American liberal-arts college, and by the editor of Spenser Studies, Board-member of the Renaissance Society of America, who rates the authors publications as only lesser than the Bible and Shakespeare. 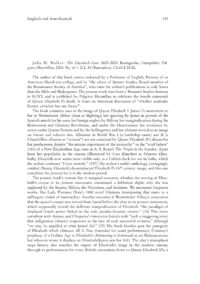 The present work rises from a Womens Studies Seminar in SUNY, and is published by Palgrave Macmillan to celebrate the fourth centennial of Queen Elizabeth Is death. It bears on American discussion of whether academic literary criticism has any future.